Being a Bzzagent means I get sent products to test & review from time to time & last week I received my latest Bzzkit to review. This time I am testing an anti-perspirant stick. 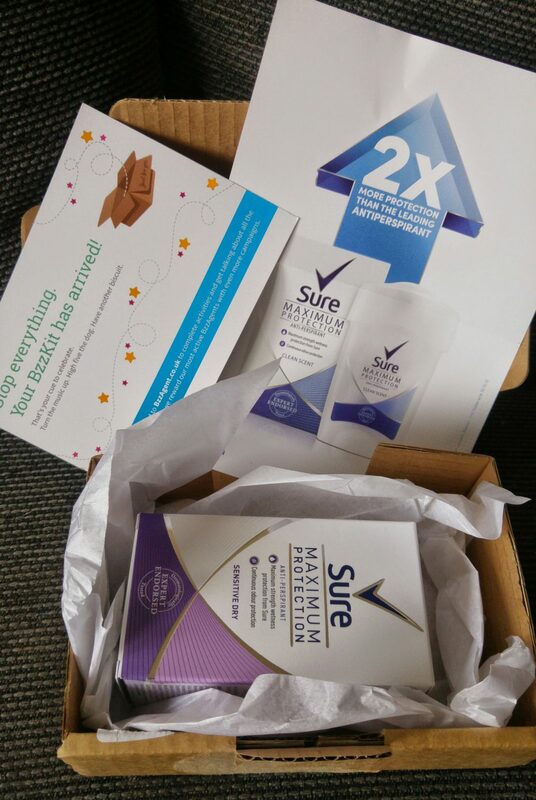 I was sent the Sure maximum protection sensitive dry anti-perspirant stick which just so happens to be…PURPLE! Oh yes! I am a fan of Sure in general I have to admit. Before testing this stick I was previously using the Sure motion sense cotton dry stick along with the Sure long lasting protection fragrance collection spray with scents of peach & wild raspberry.. My absolute favourite spray! Again the spray is purple.. Extra win for me! Since I am already a Sure fan I couldn’t wait to test this new product and see what was inside the lovely little box and was pleasantly surprised by the new shape of the stick itself. I love the purple of course but I also like the general design too. Then when you open it up it gets even funkier! The applicator has lots of little holes the anti-perspirant stick comes up through when you turn the wheel at the base which clicks as you do so. Sure recommends 2 clicks per under arm which I gave a go and it glides nicely as you apply it and covered my armpit nicely. I absolutely love the long lasting fresh scent it leaves when you use it. I’ve been using it for a few day’s now & even wore a knitted jumper & thick winter coat to really put the anti-perspirant to the test. I sweat quite a lot in my coat usually but was surprised when I got home & realised my pits were still dry and I still smelt fresh & lovely even after a panic attack. Overall I love this new Sure anti-perspirant & my old cotton fresh one has been pushed to the back of the cupboard as a back up as I much prefer the one I am currently testing. I would definitely say this is the best one I have tried yet! *All comments, views, opinions & photo’s are my own however I did receive this product free to review from Bzzagent.